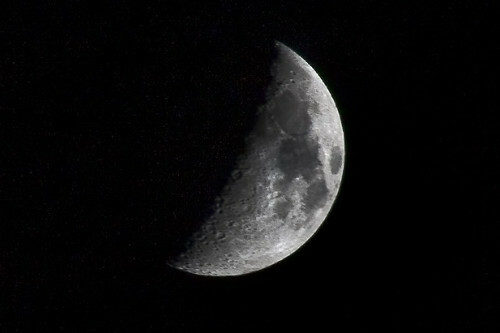 I still have a long way to go with getting a feel for the new lens, but the moon was looking too good to miss last night. A slight mist meant that the focus isn't perfect, but it's come out quite well (thanks to Toomanytribbles for the idea to turn off image stabilisation when using a tripod). I applied a little tone mapping to bring out the areas which were very bright so that there was a little more texture and I'll be keeping an eye out for the full moon in a few days. I'll keep you posted. I had a look last night but was rather too early to see the quadrantid meteor shower. Did anyone else see them early this morning? Notice by the way that Neptune is close to Venus at the moment and at magnitude 7.9 it's spottable with a pair of binoculars or a camera. I'll see if I can get a shot of it in the next few days. Mercury should also be visible with the naked eye just after sunset.